You only have one body, take care of it!!! Welcome to b-exercised! Whether you are male or female, old or young, you only have, and will only ever have, one body, so you need to take care of it. 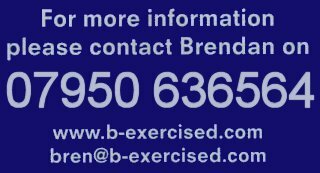 Unfortunately, despite what all the exercise and diet fads tell us, there is no quick and easy way to get fitter and lose weight, and motivating yourself to keep going can be really hard, but together, Brendan will help you on your way to a healthier, more energetic, and therefore happier you!. I will be training Miss Bloggs from Radio Hallam back to fitness.